Grilled Thai curry chicken wings are ready in just 20 minutes thanks to Tyson's Grillin' Wings and an easy homemade curry wing sauce for an easy party food! I love chicken wings. In fact my entire extended family loves wings so much that we eat mounds of wings every Christmas Eve. 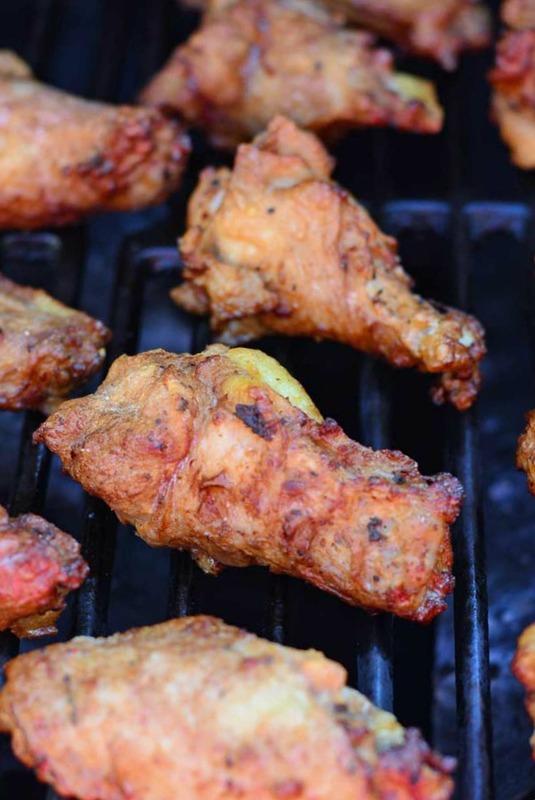 While we all love wings, we often disagree over what flavor, and what heat, we like the most. Some of us like barbecue, some prefer a Parmesan garlic, others like a traditional wing sauce. 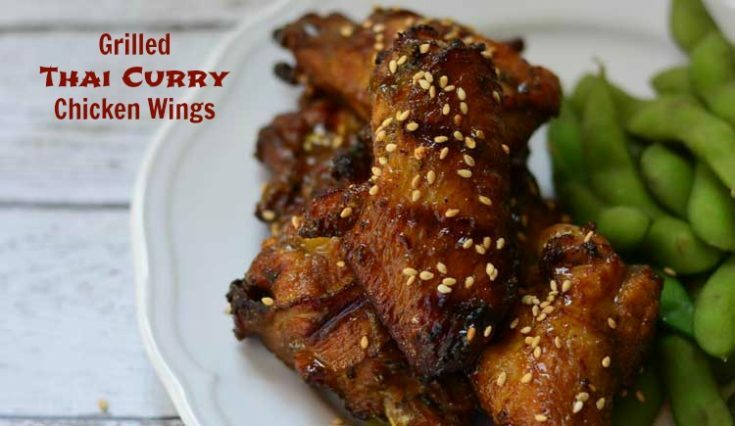 But one of our current new favorites is Thai curry wings. My dad's birthday is coming up next May and this will be first time we've celebrated his birthday with him in probably close to a decade. I keep debating over what to make for his birthday dinner. I have a few labor intensive recipes planned so I needed to find an easy recipe or two. I decided that wings would be an easy party food to make. I used pre-cooked wings to make the recipe easier. You are just warming them up on the grill, but you could also cook raw wings anyway you'd like and then use the sauce at the end. I made my Thai curry sauce first and then just set it aside while I cooked the wings on the grill. I didn't want the sauce too spicy so I used a mild curry powder and just a little bit of hot sauce, but feel free to increase the heat with extra hot sauce or even some red pepper flakes. The wings are super easy to cook! I rarely use the grill and I cooked these up just using the package instructions. I forgot to grease the grill though, as the cooking instructions said to do, and they did stick a little so make sure to oil those grates. Once the wings are done, put them in a large mixing bowl. 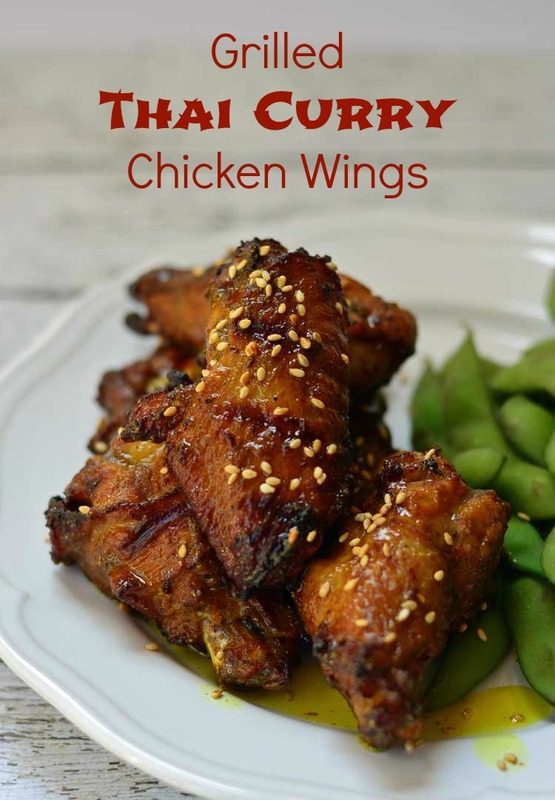 Pour the Thai curry sauce over the wings and toss to coat them thoroughly. You may need to whisk the sauce together before pouring it over the wings because the curry powder can sink a little in the liquids. The grilled Thai curry chicken wings turned out great! I let my husband taste test for lunch and he approved. I know these wings will be a hit for my Dad's birthday dinner next month. Pre-heat grill on medium heat as you make the sauce. Melt the butter in a small sauce pan. Remove from heat. Whisk in curry powder, soy sauce, honey, hot sauce and lemon juice. Adjust seasonings to taste. Set sauces aside. Grill chicken wings according to direction on the package until full heated. 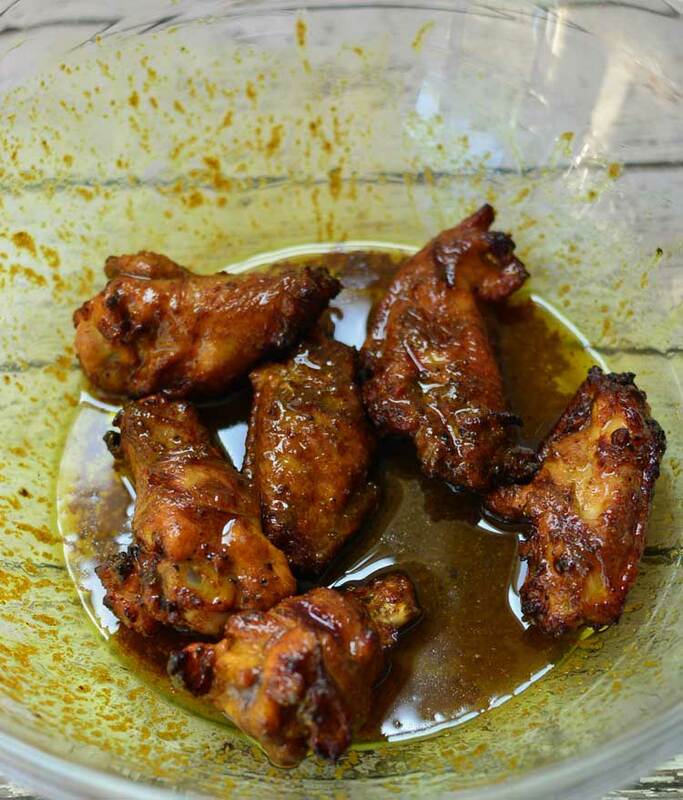 Toss the chicken wings in the curry sauce. Garnish with sesame seeds if desired. Serve immediately. Make sure to follow Tyson on Twitter and Facebook for more easy party food ideas! Delicious! Thanks for linking up with What’s Cookin’ Wednesday! Great looking Chicken Wings! Thanks so much for sharing your awesome post with Full Plate Thursday and hope you have a great week! G’day! These look very yum! Wish i could try one now! Thanks, Joanne! They were a big hit!